By Bangladesh Media; The daily New Age reports about the notorious Rapid Action Battalion's activities. In its report today the daily New Age says - any successes that the Rapid Action Battalion might have achieved in its eight years of existence have been wholly overshadowed by the hundreds of extra-judicial killings that it has carried out and the suspicion that it has been involved in the recent disappearances of dozens of people. The battalion, which started operation in July 2004 after its formation in March of that year, has till today killed at least 711 people, according to rights organizations. It has also been involved in the killing of 70 more people in joint operations it has conducted with the police, coast guard and forest guards. Although the public outrage following the battalion’s shooting of college student Limon Hossain in 2011 has resulted in a decrease in the number of killings in the past year, this has been more than made up by a sharp increase in the numbers of disappearances many of which are attributed to the battalion. The extrajudicial deaths, which the battalion has routinely attributed to ‘crossfire,’ ‘gunfight’ and ‘encounter,’ has drawn intense criticism at home and abroad. After each extrajudicial killing, the battalion in press statements have claimed that the victims were shot and killed in ‘crossfire’ after their accomplices had fired on the force. In most of the cases, relatives and neighbours of the victims have, however, alleged that the killings were intentional and that influential people had used the battalion to further their own interest. ‘Investigations by human rights organisations regularly find that victims were executed while in the battalion custody,’ said the US-based Human Rights Watch in its annual report of 2011. On March 20, 2011 Mostafizur Rahman alias Mustak, said to be an ultra left leader and also a marriage registrar, was according to the battalion killed in a ‘crossfire’ with its officers at Baghmara in Rajshahi. Mustak’s mother Monju Ara, however, alleged that the battalion members had picked her son up on March 18 afternoon from their village. On March 16, five men, said to be pirates including Jihad Bahini chief Jihad Sheikh, 33, were killed in a ‘gunfight’ with the battalion at Marabhala under Sarankhola in Bagerhat. 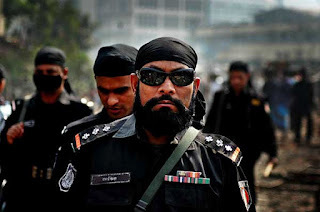 Jihad’s widow Tahmina Begum, however, told New Age that he had been picked by the battalion members from the Gabtali inter-district bus terminal about 6:30am on March 5 soon after his arrival in Dhaka. And on March 8, the battalion members shot dead a man, Mintu, aged 30, near the BCIC Housing Complex at Mirpur in the capital, with witnesses claiming that the law enforcers shot him when he was unarmed. According to a survey carried out in 2011 titled ‘Perceptions, Attitudes and Understanding: a Baseline Survey on Human Rights in Bangladesh’ by the National Human Rights Commission along with other organisations, more than 80 per cent of the people opposed extrajudicial killing by the law enforcement agencies. Rights activists said that extrajudicial killings along with more recent allegations of disappearances overshadowed the battalion’s crime prevention over the years. ‘Extrajudicial killings should be stopped by any means,’ said Adilur Rahman Khan, the secretary of the rights watchdog Odhikar. Twelve of Mukhlesur’s colleagues were also rewarded for similar ‘bravery,’ according to the police headquarters. The government also gave an award to the RAB 8 commanding officer Lieutenant Colonel Md Monirul Haque, who earned huge criticism after his troop had shot college student Limon Hossain, 16, at Chhaturia in Jhalakathi on March 23, 2011. Although the ‘crossfire’ incidents have sharply decreased amid protests following the Limon incident, there has been an alarmingly high number of enforced disappearance, rights activists said. Ain o Shalish Kendra said that 51 people ‘disappeared’ in 2011 and only 15 of the bodies were recovered. The battalion arrested 1,17,009 crime suspects, including 862 Islamist militants, and seized 9,458 firearms as of March 18, 2012, the officials said. In November 2011, the NHRC chairman, Mizanur Rahman, announced that the commission would investigate the incidents of extrajudicial killing and disappearances. The High Court issued a rule suo moto calling on the government to explain why action should not be taken against the RAB officers responsible for the ‘crossfire’ killing of Lutfar and Khairul Khalashi in November 2009. However, the relevant judicial bench was reorganised before the rearing on the ruling and the case has not since been heard by the court. The battalion continues with extrajudicial killings in violation of the High Court order, which asked the authorities on December 14, 2009 not to kill any more people in ‘crossfire’ or ‘encounters’ until it heard a rule it had issued suo moto on the government in connection with extrajudicial killings. There remain a number of undisposed cases before the High Court regarding extrajudicial killings. Legal action has also been instituted against members of the elite force who were alleged to have been involved in the looting in November 2011 of over Tk 20 million from a shrine in Chittagong in the name of a raid. Source: The daily New Age.